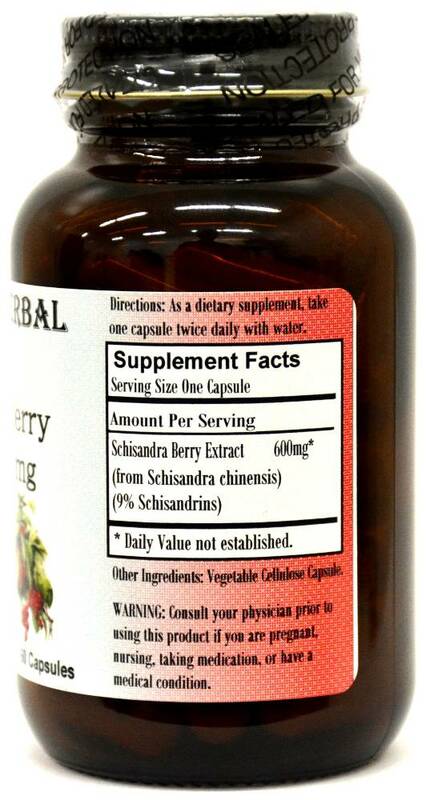 Barlowe's Herbal Elixirs now offers a high potency Schisandra Berry Extract (Schisandra chinensis) which has been standardized to greater than 9% schisandrins by HPLC. Schisandra has been used in traditional Chinese Herbal Medicine for many years. Schisandra is one of the few herbs that contain the three treasures - Jing, Qi and Shen. Bottled in Glass! No Stearates! No Fillers! No Junk! 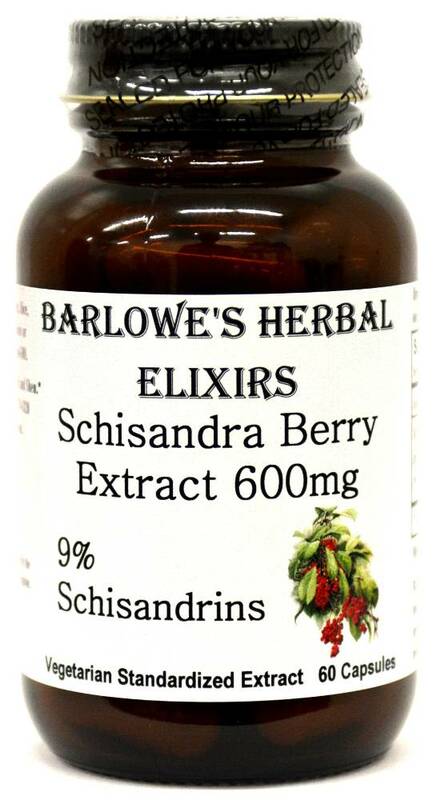 Barlowe's Herbal Elixirs now offers a high potency (600mg per capsule) Schisandra Berry Extract (Schisandra chinensis) which has been standardized to greater than 9% schisandrins by HPLC. 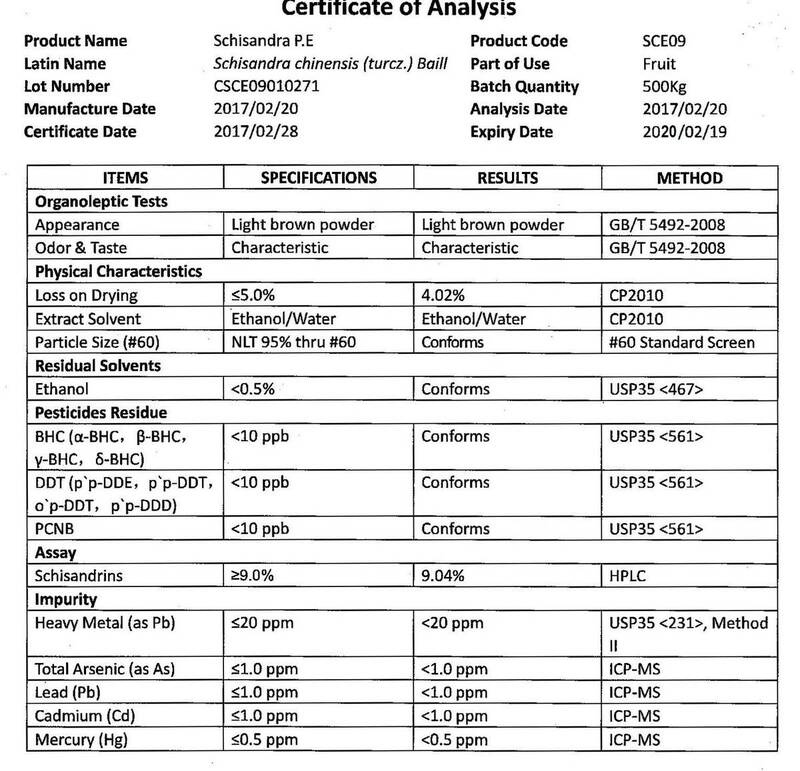 The Certificate of Analysis (COA) of this particular batch is shown above. Schisandra is a plant that has been used (through extracts from its fruit) in traditional Chinese Herbal Medicine (TCM) for many years. Schisandra is a famous tonic herb and is one of the few herbs that contain the three treasures which are known as Jing, Qi and Shen. Bottled in Glass! No Stearates! No Fillers! No Junk! Schisandra may enhance the energy of the kidney and the liver and may support sexual endurance and memory. Schisandra may provide protection from a spectrum of harmful factors such as heat shock, skin burn, cooling, frostbite, immobilisation, aseptic inflammation, irradiation and heavy metal intoxication. Schisandra may increase endurance and accuracy of movement, mental performance and working capacity. It may also help increase sexual energy in both men and women. Caution: Barlowe's Schisandra Extract is generally safe, but it is potent and should be utilized with care. Schisandra side effects are uncommon but may include abdominal upset, decreased appetite, and skin rash. This product is for dietary use. If unexpected side-effects occur, discontinue use immediately! This product may cause nausea in some sensitive people. The above statements have not been evaluated by the Food and Drug Administration (FDA). This product is not intended to diagnose, treat, cure, or prevent any disease.